Former Mayor of Indianapolis Stephen Goldsmith launched on Monday the first of several essays on government reform, in which he discusses topics ranging from government structure to public-private partnerships. "The assumptions of the last 100 years of progressive governance and the production model on which they are based no longer apply. Today’s technological advancements can power a digital government revolution and offer the opportunity for truly transformative changes," Goldsmith writes in the first essay, published by the public policy think tank Economics 21. Goldsmith, now a professor of government at Harvard University, has spent several decades working in government at both the local and federal level. 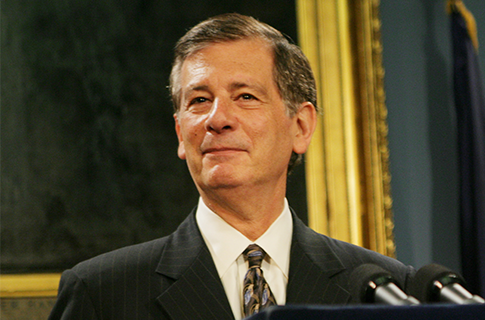 He was mayor of Indianapolis for most of the 1990s after serving as the district attorney. He then served in the Bush administration as a policy adviser. Most recently he served as a deputy mayor in New York City under Michael Bloomberg. The current fiscal debate in Washington, D.C., is about the wrong issue, Goldsmith said in an interview. The debate is "all about the amount of money and not how it is spent." "If you have limited resources, you should be spending every single one of those dollars to maximize results," he said. His experiences in city government heavily shaped the way he approaches government programs, he said, as mayors work directly with residents and have to make programs work well with limited resources. Government today is organized in "very sharp vertical silos" that do not fit people’s lives, Goldsmith argued. People live in horizontally organized worlds, while the government is organized vertically, an incongruity that leads to problems and inefficiencies. Goldsmith gave the example of a struggling mother. She receives government aid from several different sources—Medicaid from the Department of Health and Human Services, food stamps from the Department of Agriculture—and her children could receive aid from yet more areas, compounding the places where she has to interact with the government and its bureaucracy. "If you think about it, not only is that expensive and often redundant, it doesn’t leverage her life," Goldsmith said. "Right now the government is not organized to streamline and maximize the resources at its disposal." The government should be able to harness new tools like big data and online networking in order to transform how it delivers services, Goldsmith contended. While he was a Republican during his time in public service, Goldsmith described himself as a "small government pragmatist" who is willing to work beyond party divisions in order to accomplish what needs to get done. "I’ve never been in favor of just more money to solve problems," he said. As mayor of Indianapolis, he privatized some public services in order to allow their quality to rise while the city simultaneously and repeatedly cut taxes. Simple privatization is not a silver bullet, though. While conservatives often look to privatize in order to reduce costs, Goldsmith cautioned against a blind adherence to privatization and outsourcing. "I don’t think that the private sector in and of itself can solve the government’s problems," he said. He criticized the Bush administration in his first essay for simply establishing "targets" for outsourcing government jobs to the private sector. "Bidding needs to be a mechanism to purchase innovation from the private sector rather than just transferring funds and responsibility away from the government," he wrote in the essay. "It’s how the sectors are arrayed … that makes a difference," he said. The government should look to harness the unique parts of the private sectors, like its ability to innovate, in order to improve social services instead of simply forcing the private sector to do precisely what it wants in minute detail. The government also looks at how it funds projects in the wrong way, Goldsmith wrote. The government funds activity instead of results, which, combined with the government’s vertical structure, results in a poor way of looking at its programs. "Too little thought at the appropriation or agency level involves a true definition of public value—what outcome is important to the public. Instead, we fund and track inputs—homeless shelter beds rather than the reduction of homelessness, or visits to the doctor instead of good health," he writes. Goldsmith said he hopes his essays will shape how government executives approach their work. "They should be less prescriptive and more demanding about the results that they come up with," he said. This entry was posted in Politics and tagged Federal Bureaucracy, Financial Crisis, Obama Administration, Obama Economy. Bookmark the permalink.